There is a love/hate relationship when it comes to a freight broker obtaining a new customer. They love getting the new customer but hate the process for doing so. Unfortunately, all freight brokers know that to get a customer they must prospect and make the sales call. When we speak of prospecting we’re referring to finding potential customers to contact in hopes of them choosing to use your service. The contact would be the actual sales call. What most brokers hate about prospecting and sales calls is that it’s monotonous. I’ll be the first to agree, but I’ll also be the first to tell you that if you don’t, you’ll never have real success as a freight broker. A freight broker is first and foremost a salesperson. That’s why a good freight broker is paid well. 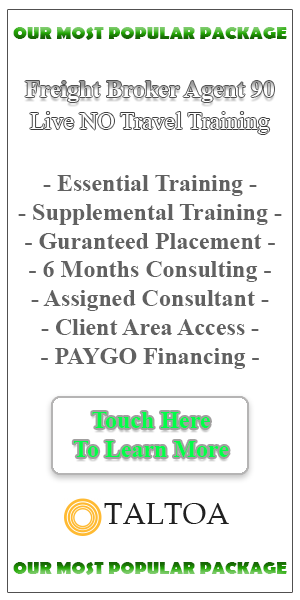 Standard commission for a freight broker agent is 60%. Regardless of the company, product, or service, you’ll find that salespeople are normally paid well. Why is this? The simple answer is because not everyone can do it. The real answer is that not everyone will do what it takes to be successful. I’ve heard many say that they’re not a natural born salesperson. The fact is everyone is a natural born salesperson. You’ve been selling your entire life. Selling yourself in a job interview, selling the idea of him or her going out with you, selling what you wanted for your birthday or Christmas. Get the idea? What you must learn to be a successful salesperson is the process. Prospecting and sales calls are part of this process. You have to start thinking and working like a professional salesperson. As you start thinking and working like a professional salesperson, things will start to happen. A professional salesperson is disciplined. They know that if they don’t make a sale they don’t make the money. To have the opportunity to make a sale they must have someone to sell too. This is prospecting. You can’t have too many prospects. A professional salesperson knows that they must make the sales call. If they don’t, again they can’t make the money. A professional salesperson doesn’t care about rejection, they don’t care how many no’s they get. They are focused on obtaining a yes! Professional salespeople understand that they also earn money from people telling them no. It’s part of their job to hear people say no. But how can one make money when they were told no during the sales call? Well, let’s say that a salesperson made 10 sales calls today, they were told no nine times and yes once. Over the course of the year that one yes earned the salesperson an income of $10K. The professional salesperson would see it as making $1K per sales call. Even the no’s made the salesperson money. A professional salesperson will keep good records. They can tell you how many sales calls they must make to get a yes. They can tell you how much money they’ll make, on average, from each sale. By knowing this information, a professional salesperson can know exactly what they must do to earn the money they wish to earn. They also know what must be done to add to their income. They have a process. How does all of this play out for a freight broker? First, a freight broker must prospect and make sales calls, that’s a given. As a new broker doesn’t have customers or loads, they must make hundreds of sales calls. The more calls the new broker makes the better they will become at making sales calls, at least they should. The better they become the more customers they’ll add to their customer base. The more customers the higher their daily load count. From this daily load count they’ll begin to collect the data needed to know which customers and loads are making them money as opposed to the ones that are not. As a new freight broker begins to recognize the numbers and learns how to read them, they are able to zero in on how many sales calls they must make to obtain a customer, how many customers they must have to make X amount of money. Once they learn how to read the data from their past work, the more profitable their future work will become. It’s not easy, if it was everyone would be doing it. But it’s being done every day. There are many freight broker agents that earn a six-digit income. It doesn’t happen overnight, it takes time and work. If you have questions, please feel free to call and speak to one of our consultants.